O. perpusilla is a member of the eleven strong O. funerea group and was formerly better known as O. punctulata. 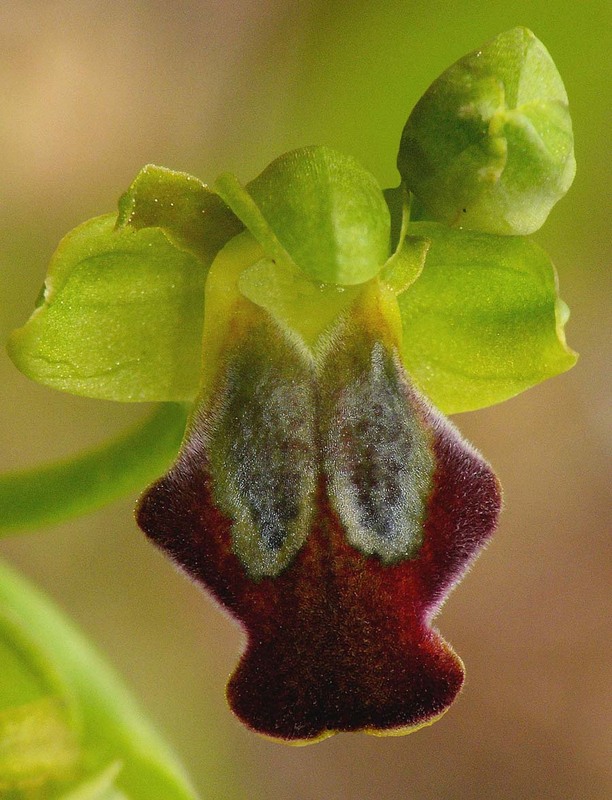 It was first described in 2004 from Etolia by Devillers-Terschuren and Devillers and its name is a reference to its small size, a key characteristic when trying to identify this rare Helenic Ophrys. Its range is not fully understood but it's thought to be present from the Ionian islands in the west, to the Aegean islands in the east. Its mainland distribution in continental Greece seems to be largely south of the Corinth canal IE:- Peloponnese and Attica. 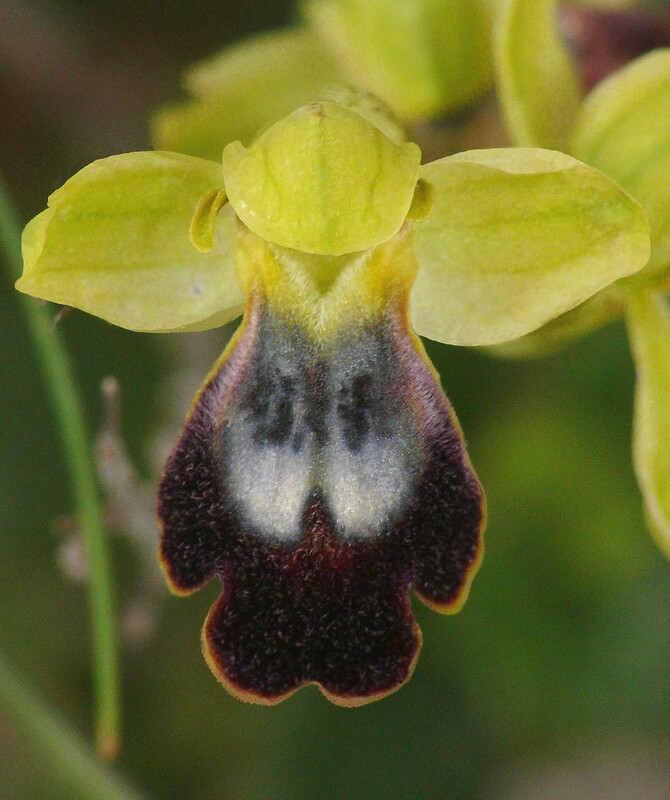 It is a highly variable Ophrys that may easily be confused with other taxons and its this variability together with the high probability of misidentification that account for its range being so poorly known. 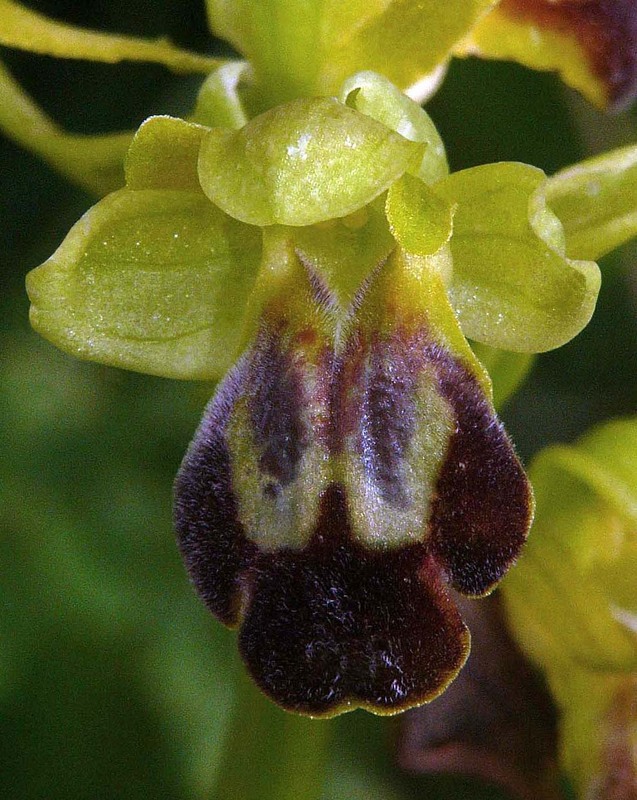 O. perpusilla is often confused with two species in particular, O. melena and O. cinereophila both of which share morphological similarities. The latter species is most easily recognized by the strong curvature at the prominences which can be likened to a bent knee joint. In O. perpusilla the lip is reflexed but most noticeably in the distal area. It always has a yellow margin and most usually this is broad and shows little gradation IE:- it is obvious and well defined. Face on photographs tend not to portray this feature, being obscured by the lip recurvature. The pictures are from the Peloponnese, Rhodes and Lesbos dating from the second week of April.